Google Keyword Planner is one of the free tools commonly used by bloggers for keyword research. Unfortunately, this device is not friendly for the person who first used it. Instead of knowing a number of keywords, the person will "fall" into the page creating the first AdWords ad campaign. Wonder, dizziness, and irritation will usually be experienced by those who enter the page. How not, its purpose is to know the volume of a search of a keyword and its relevant keywords, even as if "ordered" create an ad campaign that must be paid by credit card. Oh yes, the example of the page I mean is like this. 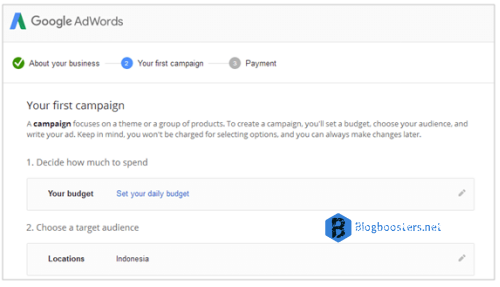 Well, for those of you who will use the Google Keyword Planner for the first time and don't want to "fall" into the page above, follow the steps below. 2. 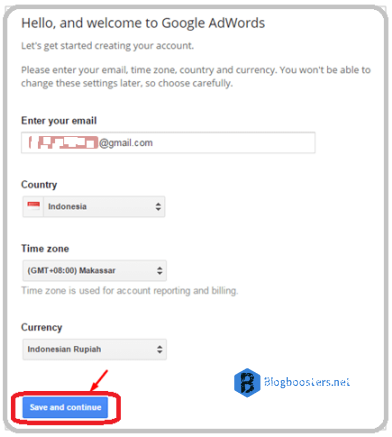 Click Sign in and enter your Gmail address and password. 3. You will see the Welcome to Google AdWords page. This is where the key is by clicking Skip the guided setup. 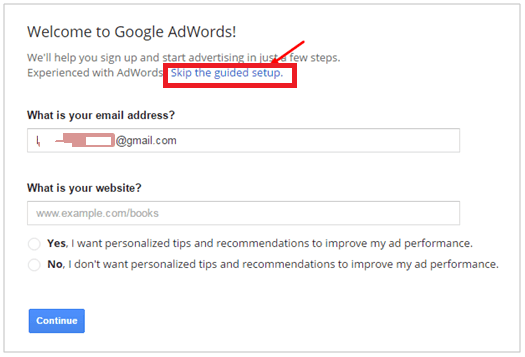 Remember, don't press the Continue button because you will enter the AdWords ad campaign creation page. 4. On the page that appears, re-enter your Gmail address. A country, time zone, and currency are optional. After that, click the Save and continue button. 5. Click Tools and select Keyword Planner. 6. Klik Get Search Volume data and Find New Keywords. 7. Type the keywords that you want to check the search volume for. Can be more than one in one check. In the Targeting section of the country, select Indonesia. Continue by clicking Get search volume. 8. See the results that appear. The example below. 9. To check other keywords, type the keyword in the Enter keywords box then click Get search volume. Such is the short tips for using Google Keyword Planner for the first time with the aim of keyword research. For those of you who have "fallen" to the AdWords ad campaign page, the solution is to create a new Gmail. After you have a new Gmail, do the steps above. Not difficult, right?